Sydney Shop Girl: A Year in the Knife. Nigella and I Find Inspiration Everywhere. A Year in the Knife. Nigella and I Find Inspiration Everywhere. I've been a bit topsy turvy all day, if the truth be known. It's been 12 days straight with work and my sleep deficit just caught up with me today, I guess. I got home from work early and had an evening nap. I just woke up an hour ago and had a home cooked dinner that ended with a decadent dessert courtesy of Mr SSG. The disorientation is just starting to settle. Thursday June 24 2010 was one of those 'I was doing ..... when ..... happened' kind of days for Australia. Julia Gillard became our first female Prime Minister and her predecessor Kevin Rudd received the dubious honour of being only the second Australian PM to be 'knifed' whilst in power. It was a bittersweet and emotional day. According to my blog entry for that day, the news knocked the Socceroos' victory over Serbia in the World Cup off the front page of the paper. 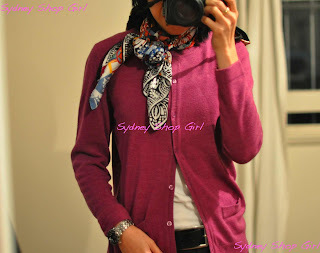 I can't believe I've been blogging long enough to be able to look back on posts a year old. For the record, I was at work when the political news broke, sharing the moment with others who had crowded around the closest television to see and hear it for themselves. One year on, a year in the knife. It's Friday June 24 2011 and the political climate in Australia is just as fraught with emotion. It's the end of a rather long week for Julia Gillard, preceded by several other rather long weeks. The National Broadband Plan has just been agreed on (perfect timing) but the other issues that defined 2010 still remain to be resolved - the carbon tax, the mining tax, border protection and Afghanistan. Other countries are beginning to declare themselves with regard to Afghanistan and troop draw downs. I hope Australia makes the right decision soon. Then there's the issue of frighteningly low approval ratings and the ongoing tension with Kevin Rudd simmering just off centre stage. I am relieved Kevin Rudd cancelled his 'Assasination Anniversary Party'. There's no shame in just disappearing off to the Maldives with Therese for the week instead, Kevin. No shame at all. Sometimes you just have to let the anger and hurt die rather than fester. Keeping it alive does no one any favours. Besides, it's impossible to stay down in the dumps when you're surrounded by tranquil waters and beaches. Now that I've got that off my chest, I'm going to try and remember what I actually did today. The day started with coffee. Friday morning skinny caps are always special. And an inspired fashion moment. I'm meant to be reading the book as I watch the episodes but it's so soothing just watching Nigella, the last thing I want to do is read along. That came to me last night whilst I was catching up on Nigella's Kitchen series. The episode was themed 'Inspiration Everywhere'. I think Nigella was speaking of food. I was thinking sweater colours. Never mind. There's no disputing though that vivid shades of magenta do wonders for dark hair. 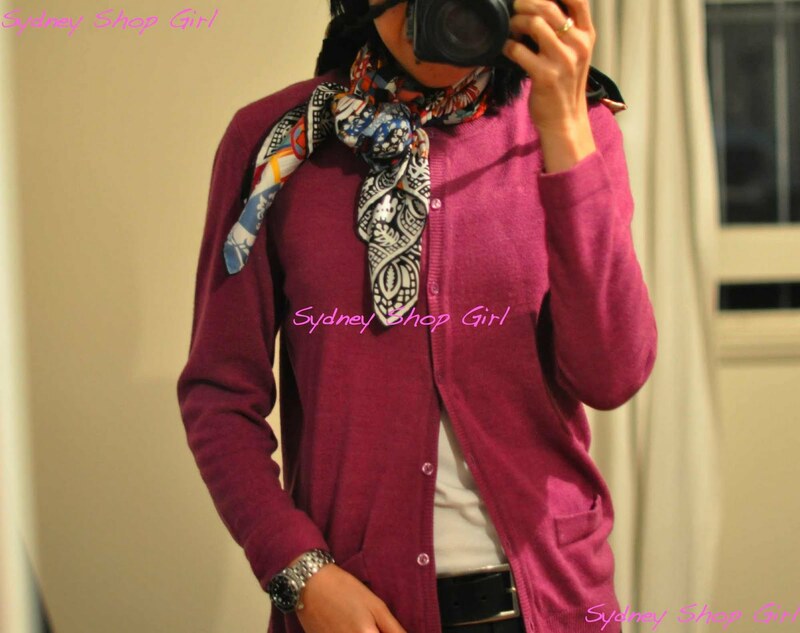 Scarf - Hermes, scarf ring - Mai Tai Collection, cardigan - Target, tank - Big W, belt - Gap, trousers - David Lawrence. I have nothing but good things to say about my Target cardigans. They're warm and they're long enough to not ride up my waist the moment I actually start doing things. Right, think I've gotten myself reorientated to person, place and time. Work filled in the hours between getting dressed, getting coffee and having that evening nap I started talking about earlier. After the nap. What happened after the nap? 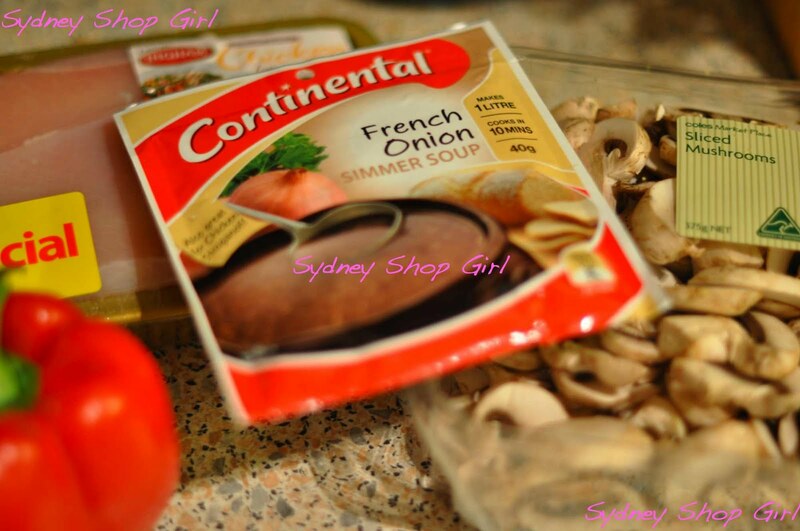 You know how much I love a packet of French Onion soup mix. It's the basis of lamb casserole and apricot chicken but strangely not soup in my kitchen. Well, tonight I decided to make Chicken Stroganoff as per the instructions on the back of the packet. I was a bit sceptical because it looked so easy. 500g chicken, 2 cups of sliced mushrooms, half a red capsicum, sour cream and a packet of soup mix? It was actually really good. 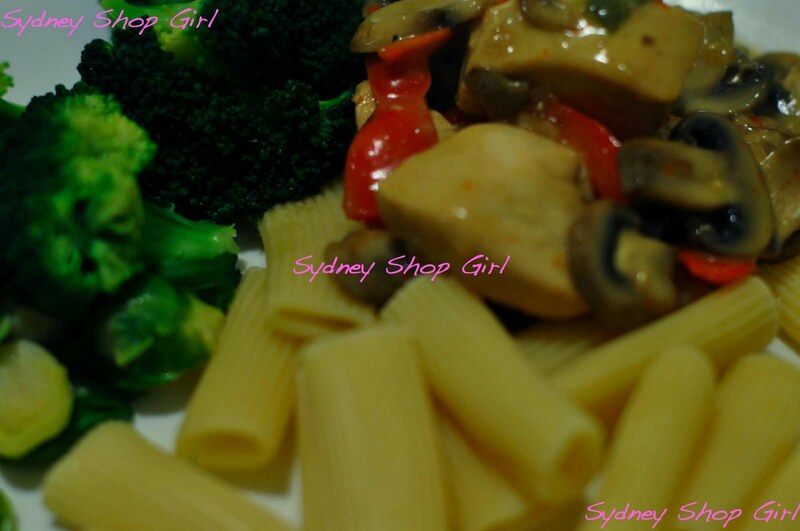 The sauteed mushrooms and red capsicum gave the dish this really rich taste. 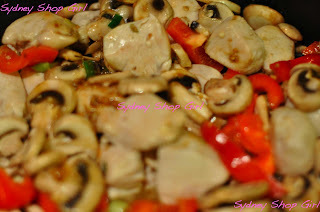 Maximal impact for minimum effort, especially if you bought your mushrooms pre sliced. I have to confess to cheating with the sour cream. I didn't have any so I squeezed some lemon juice in with some cream. It works with regular milk to make buttermilk too. I served it with plain cooked pasta. Which worked well because of the richness of the stroganoff sauce. Needless to say, it was a dessert night. Real dessert rather than the nutrionist's interpretation of the word (read 'a piece of fresh fruit'). Mr SSG picked up a little something from the Central Baking Depot. A bakery I can't believe I've not been to yet in my 4 years living in Sydney. No fork necessary. This tart is best enjoyed by biting straight into it. 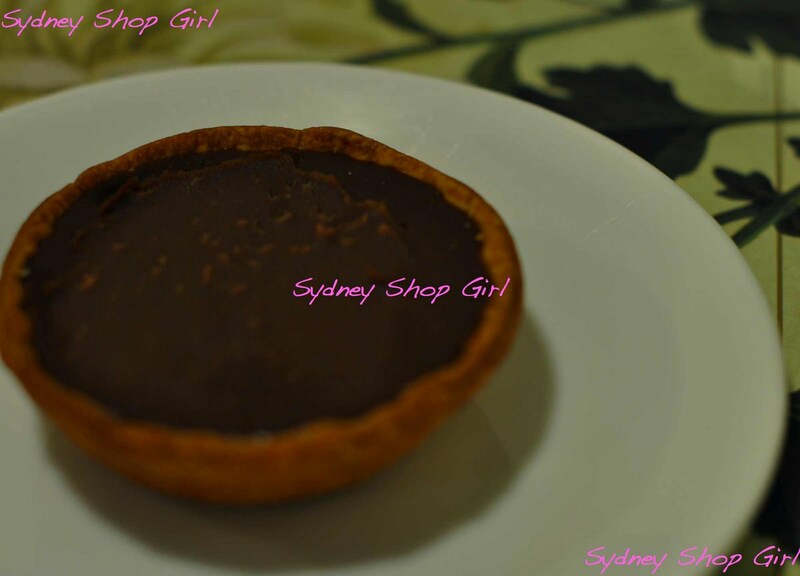 There's one word to describe their chocolate ganache tart. Heaven. The pie crust is crisp and brittle. The ganache. Oh my. It's chocolate, it's caramel, it's moreish. There are times when food really does awaken all your senses and this, readers, was one of those moments. Mr SSG had the poached chicken and chilly mayo sandwich for lunch today and he gave it two thumbs up and a promise to go back again for lunch next week. I'm trying to persuade him to bring back another chocolate tart or two for me when he does. I hope this post reads okay, after that political bit at least - the dithering in those paragraphs embodies that of the subject matter, I'm afraid. I'm off to bed for keeps now. Talk to you tomorrow. Don't worry, I'm not working and I promise to be fully recharged too. That chocolate tart looks fantastic. I had half a Moro (they seem to have reappeared in Coles) and that doesn't compare! I can't do more than 12 days straight - around day 10 I start getting emotional and when I'm not apologising, I'm being very grumpy. Sleep in tomorrow and have a lovely relaxing day! I am a huge fan of Central Baking Depot. The apple and blueberry cake is awesome and the ham and cheese croissants are fabulous. The sausage rolls, pies and quiches are all stunning - mostly because this place is Bourke Street Bakery in another guise! 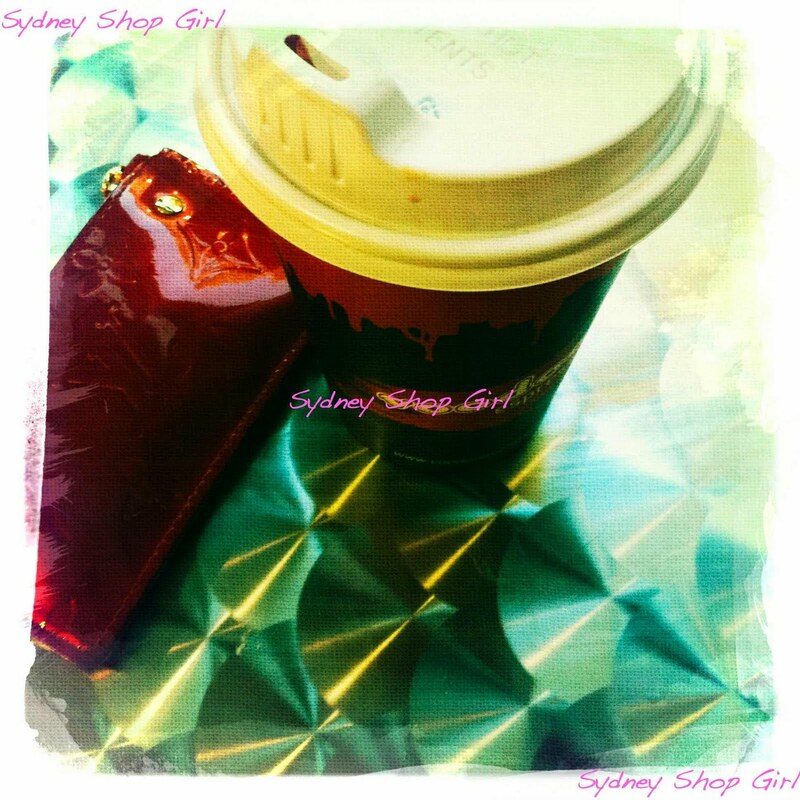 They now have one in Neutral Bay which is very amenable! I can't remember where I was when Kev was knifed. Sad I guess because I do miss him. The stroganoff looks very warming. I am a big advocate of naps too. Wow, 12 days at work straight - that treat from Central Baking Depot was certainly well deserved! The magenta outfit looks great, such a lovely, vibrant colour! I love reading your posts which summarize the latest news through an honest Australian's point-of-view. 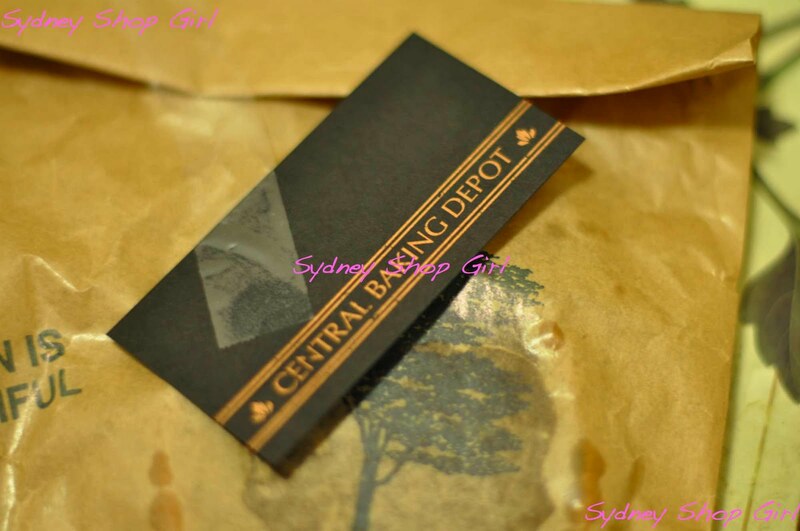 I'll have to visit Central Baking Depot ASAP though! Enjoy your weekend~ this weather totally beats the rain! You've got to love those evening naps followed by good food! Something about them just screams of being on vacation to me! Thanks for letting me live that feeling vicariously through you. Thank you all for your kind words and well wishes. Yep, definitely feeling more alive today.